Foursquare agreed in March 2015 to power location data on tweets with location tags, but not much has come of it, until now. 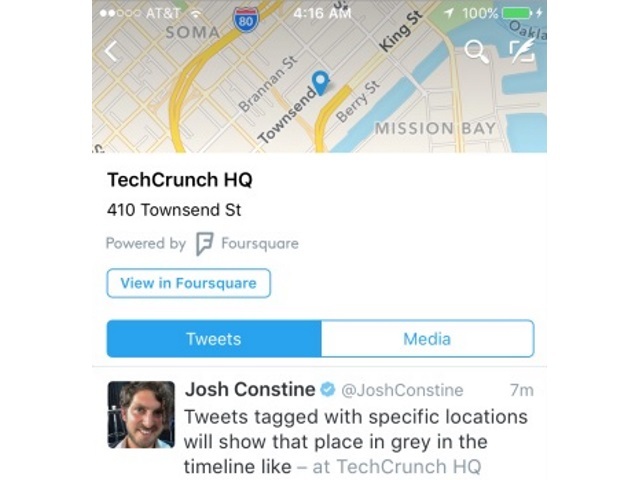 A reader tipped Josh Constine of TechCrunch off to the existence of Foursquare-powered location feeds on Twitter, and Twitter confirmed to Constine that it is currently rolling out the feature to IOS users, with other platforms to be added soon. Constine wrote that Twitter users who tap specific Foursquare-powered locations or cities tagged in tweets will be taken to a new location feed with a map at the top, where they will see tweets from that location. He added that there currently does not appear to be a way for users to search for these location feeds, other than by accessing them via the type of tweets mentioned above. Twitter iOS users: Are you seeing Foursquare-powered locations? Screenshots courtesy of Josh Constine, TechCrunch.